There is growing recognition that the social and economic challenges affecting individuals and communities are highly interconnected. 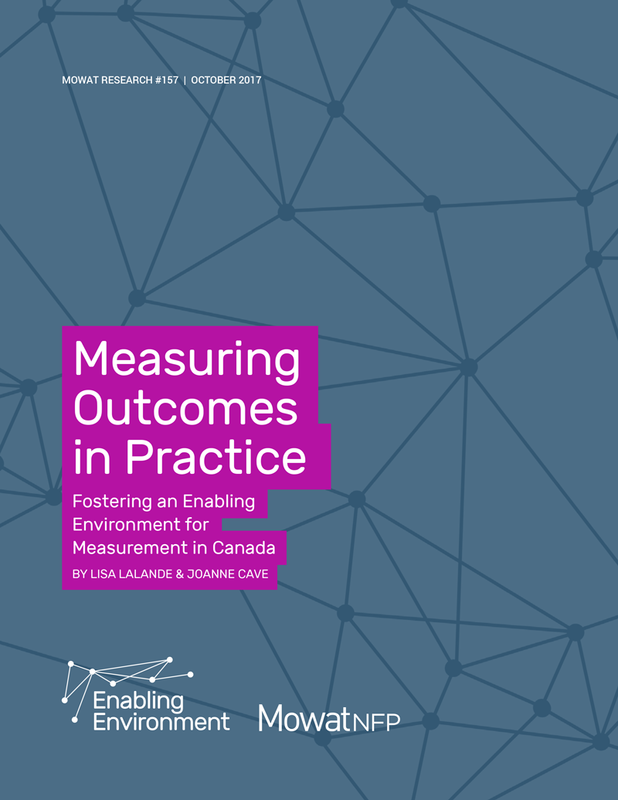 Measuring Outcomes in Practice, a new report from Mowat NFP’s Enabling Environment series, argues that to address the root causes of these challenges in a systematic way, the charitable sector must shift from measuring outputs to measuring outcomes. The paper examines current barriers to measuring outcomes, highlights key challenges, and explains why measuring outcomes is so difficult to do in the sector. It explores what is needed to create an enabling environment for Canada’s charitable and nonprofit sector to participate more readily in measurement activities. It provides actionable recommendations for the sector, governments, and other funders to work together to strengthen the evidence ecosystem in Canada and ensure their collective efforts are making a difference in the lives of the people and the communities they serve. Charitable and nonprofit organizations are increasingly applying a systems-lens1 to the concept of impact, recognizing that the social and environmental issues they work to address are highly interconnected. There is greater recognition that, in the pursuit of long-term social change, one must address the root causes of social issues.2 A systems-lens encourages organizations to reflect on their contribution as part of a collective effort. Measuring to outcomes supports this shift by changing the frame: focusing on how a program or service contributes to a better quality of life for Canadians, rather than what the program or service delivers. Charities, nonprofits, philanthropic organizations and a growing number of social enterprises are invested in facilitating this transition, particularly as governments face greater scrutiny about how funds are spent, what outcomes are achieved with those funds and how evidence of “what works” can drive the policymaking process. Yet, the shift from outputs to outcomes remains one of the most significant challenges in the sector. Why is measuring to outcomes so hard to do in practice? How can the sector, government, and other funders/investors work better together to make sure that our collective efforts are in fact making a difference to the quality of life for people at home and abroad? How can we ensure that, in today’s tight budgetary environment, we are allocating resources effectively? The time is ripe for change. Provincial governments, such as the Government of Ontario, are currently exploring common approaches to measurement.3 Employment and Social Development Canada recently convened a Co-Creation Steering Group to develop a National Social Innovation and Social Finance Strategy. Their objective is to identify approaches that address the most difficult problems in communities in order to improve the wellbeing of Canadians.4 This strategy will offer the platform for charitable and nonprofit organizations to collaborate and align priorities on outcomes measurement in Canada. Identify recommendations for governments, funders and the social sector to create a more enabling environment for outcomes measurement.